We have had some really rough weather over the last few days and it seems to be getting colder. The Little Miss and I took a blustery, chilly but rather invigorating walk today. 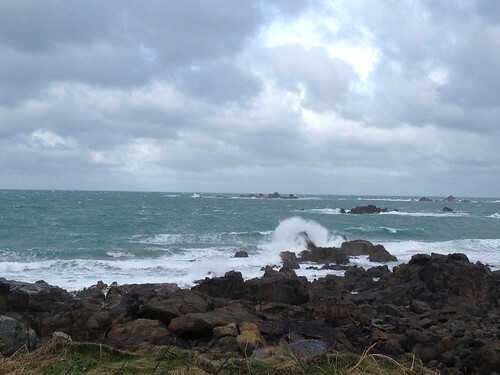 Even in the coldest and greyest of weathers I am so grateful to live in Guernsey. Tonight I went out for a lovely meal with The Mister but the photos I took in the restaurant are far too dark! 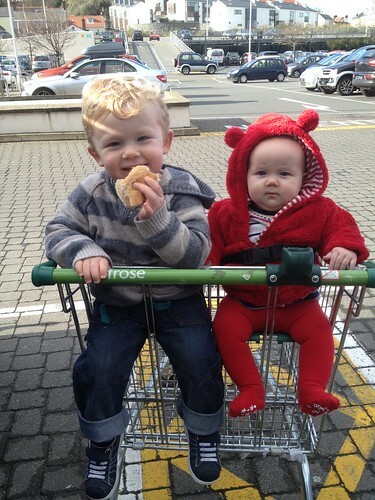 I took the kids to the supermarket this afternoon and for the first time The Little Miss sat up int he child seat, not the baby seat. The Little Mister was quite worried about this until he was sitting next to her and able to hold her hand. He really is a very lovely, protective brother, even though he tries to batter her around the head on occasions! I love this man so very much, even when I am a grumpy, moany miserable old bag and still loves and supports me. That’s worth a lot these days. I cannot believe that my gorgeous girl is 6 months old today. She has brought us a huge amount of pleasure and she is a really good girl. So, on her half birthday we started her on a bit of food. 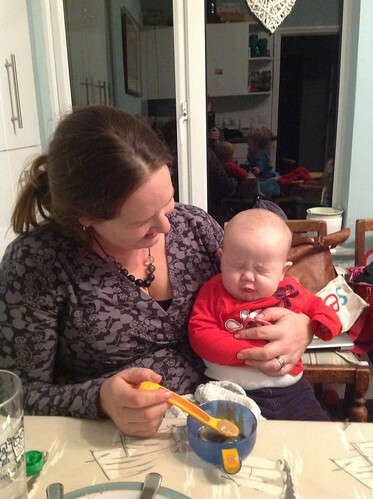 I don’t think she is that impressed! The Little Miss is finally out of her carry cot and sitting up next to her brother. He likes to hold her hand as they go along. I love this buggy. 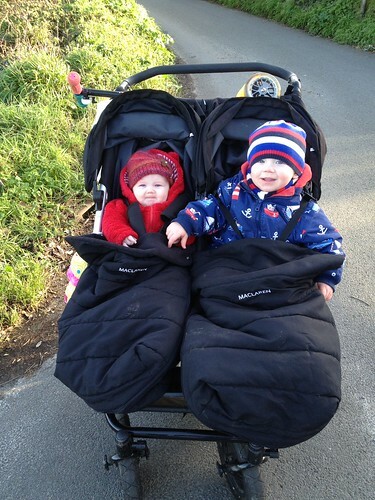 It is a Mountain Buggy Duet and feels a bit like a tank. It is really narrow and goes through pretty much any door. Certainly one of the best side by side doubles out there. 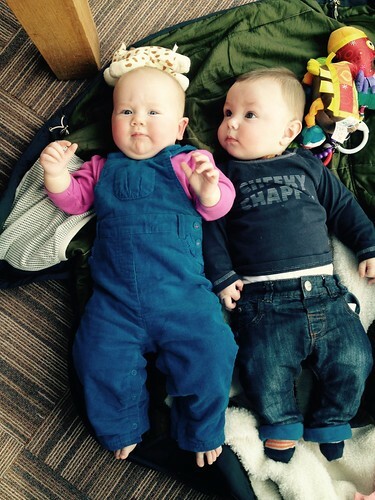 Here is The Little Miss and her friend Henry who was born on her due date and is three weeks younger than her. 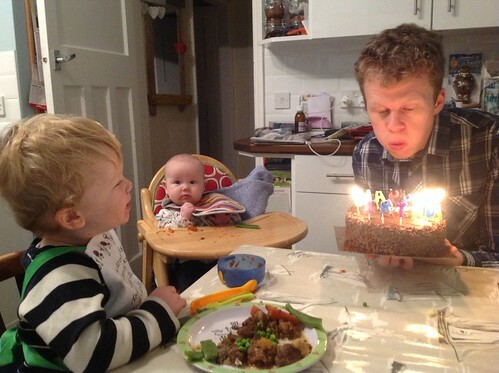 Henry is the youngest son of the kids childminder. She certainly doesn’t do things by halves and looking after two babies, as well as the older children is just hard work. We are very grateful that the children love being with Nikki. It certainly makes leaving them easier. Today we had lunch at my lovely Auntie Josie’s house – a fab roast dinner and a delicious trifle. One of the things I miss most about Mum is her Sunday lunches! I miss just being able to turn up there and have lunch all sorted. She worked so hard for us. 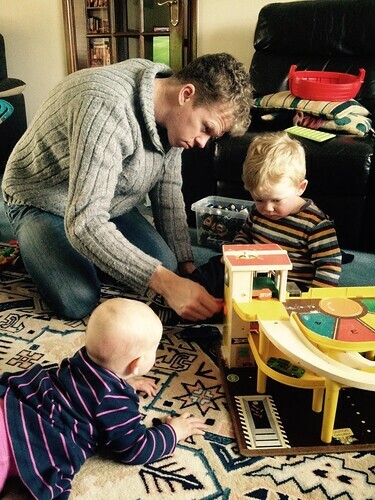 I love this photo of the kids and the husband played happily with this old garage. It used to be at Gran Nora’s house and I spent many happy hours playing with it when I was a child. It made me smile so much to see them enjoying it as I did. 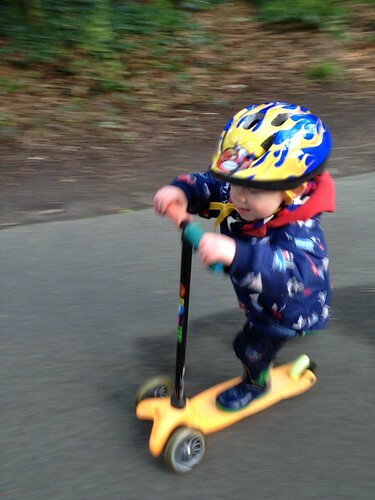 The Little Mister has got really speedy on his scooter. It’s amazing how fast his balance and skills have improved even in the last couple of weeks. This afternoon we took a walk to the park and let the speed demon take off. Gorgeous weather and we saw quite a few people we know. Happy days with the family. This afternoon the kids and I went for a walk with friends around the park. We have a brilliant park near us but there is one thing that is sadly lacking at the moment, a children’s play park. There is a really good reason for this. About this time last year they shut the playground, levelled it and starting building this awesome pirate ship playground. The committee involved in fundraising have done a great job but they have only raised about half the £500,000 they need to complete the build. What I don’t quite understand is why they had to be quite so ambitious. All we really want is a good playground with space for our kids to run about, jump, swing and slide. 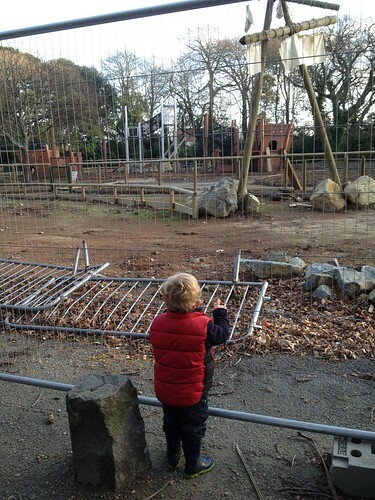 So far we have been without a playground for a year and goodness knows how much longer we are going to have to wait for it to open. 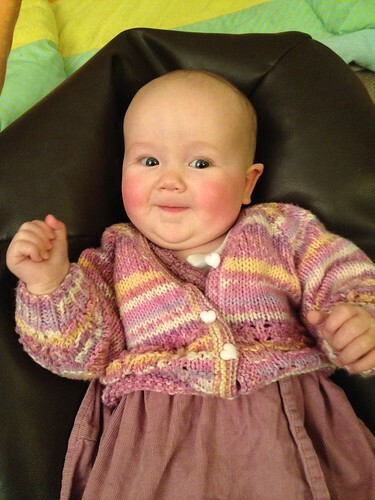 Here is my lovely smiley girl wearing one of her lovely cardigans that Grandma made. Judging by the colour of those cheeks I reckon she is teething.